Figure 2 A schematic presentation of the chemotaxis pathway. The chemotaxis receptors are coupled to the histidine kinase CheA by CheW. Binding of attractant at the periplasmic domain of the receptor downregulates the phosphorylation rate of CheA. CheA is phosphorylated by hydrolyzing adenosine triphosphate (ATP). The phosphorylated CheA activates two response regulators CheB and CheY. Phosphorylation of CheB activates its effector domain, which demethylates four glutamate sites of the receptor cytoplasmic domain, while a methyltransferase CheR constitutively methy-lates these sites. Phosphorylation of CheY modulates the flagella motor. Phosphorylated CheY docks the motor switch apparatus and controls the direction of motor rotation (clockwise rotation of flagella causing tumbling behavior of bacteria). Both CheY and CheB catalyze autodephosphorylation. CheZ, a phosphatase, enhances the dephosphorylation rate of CheY. suggested a small but significant intersubunit conformational change (al with respect to al')  and even smaller intra-subunit conformational changes (al with respect to a4) . The main difference between structures of the apo and complex forms of the periplasmic domain is a small, approximately 4°, rigid-body rotation of one monomer subunit with respect to the other in the dimeric domain [22,30,33]. The crystal structures of E. coli Tar periplasmic domain in true apo and pseudoligand-bound forms  provided further evidence in favor of dimeric signaling models [32,35] involving intersubunit motion. Because the apo and Asp bound domains are in two different crystalline environment, it is not clear whether these small conformational changes are functionally relevant or caused by differences in crystal packing. Figure 3 Two models of transmembrane signaling mechanism. (a) Dimeric signaling model; (b) monomeric signaling model. In contrast to crystallographic data, biochemical and other biophysical studies provided information that led to monomeric signaling models of transmembrane mechanism. Results from site-directed disulfide chemistry [24,25,32,36-39], site-directed spin labeling electron paramagnetic resonance (EPR) , and nuclear magnetic resonance (NMR) [41,42] are best accounted for in terms of a piston type motion that involves a modest (1-2 A) sliding of the transmembrane helices across the membrane within a monomer, which subtly rearranges packing of the cytoplasmic four-helix bundle, thereby transmitting the signal . 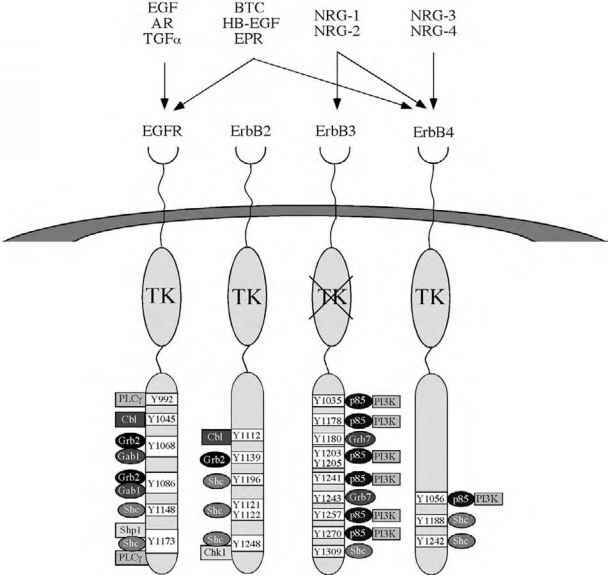 In both the dimeric signaling and monomeric signaling models (Fig. 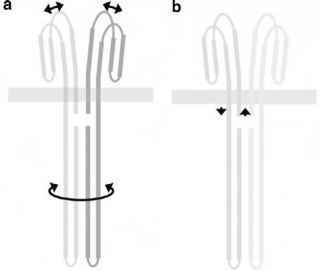 3), it is generally accepted that the ligand binding induces a small conformational change resulting in subtle movement in the periplasmic domain as well as transmembrane helices, which, in turn, is transmitted to the cytoplasmic domain. However, conformational differences as small as those observed are subject to other interpretations.